H383-95, H384-95 units are designed to hold smaller spools of wire. H383-95 has a convenient handle for portability. 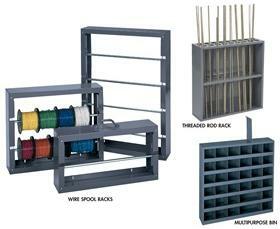 H368-95 unit features 4 plated steel tubes to hold heavy spools as large as 10" dia. Separates and protects threaded rods in 18 sections -- each section 2-1/16" dia. Removable vertical dividers allow the creation of double-width openings, each with scoops. Can be wall mounted. H383-95 A 1 26-1/8 x 6 x 10-3/8"
H384-95 A 2 26-1/8 x 6 x 17-7/8"
H368-95 A 4 26-1/8 x 6 x 37-1/8"
H367-95 B 18 24-1/8 x 6-7/8 x 24"
H314-95 C 36 23-3/4 x 4-3/4 x 23-3/4"